Yet again the RSC surpass themselves with their festive offering of Ella Hickson’s new adaptation of the JM Barrie classic. The ingredients are all there for a fabulous family theare trip. Lavish flocks of flying actors, scenery that swirls from the Darling children’s bedroom in Edwardian London, to the lagoons and secret hideaways of Neverland. A thoroughly dastardly Captain Hook (for once not doubled up by the actor playing Mr Darling) and possibly the most stylish Crocodile ever to grace the stage. Oh and the pirate ship is impressively scary too. So, with the kids sorted, what have the RSC laid on for the grown-ups? Quite simply a tale that will make one think, laugh and leave tear ducts positively drained by the final curtain. Introduced to the Darling children, all played by adults and thus lending an enhanced air of make-believe/pretend to the whole tale, we meet Wendy, Michael and John along with their fourth sibling, Tom. Early on, Tom takes ill and dies. (His death is not at all visually harrowing for little ones, but lays down an emotional sub-text of such simple power that it renders many adults sobbing in the first 15 minutes). And this is where Hickson strikes pure gold. Wendy, the most caring of the children, is concerned for the grief of her family and from her desire to just “bring Tom back” to assuage their pain, so does Peter Pan become conjured up as the play takes us to Neverland to look for Tom amongst the Lost Boys. 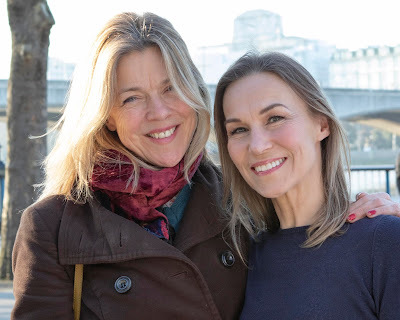 In her debut RSC season Fiona Button is Wendy. Wanting to play with the boys, but weighed down by the expected sexist burdens of expected household and family responsibilities, hers is a cracking performance of a young woman on the verge of a much longed for emancipation. The depth of Wendy’s character and how Button makes her soar (in all senses of the word!) will stay with me for a long time. Sam Swann is Peter, playfully pushing at Wendy’s naivete yet craving the maternal nurturing for so long denied him in a performance of clever complexity. 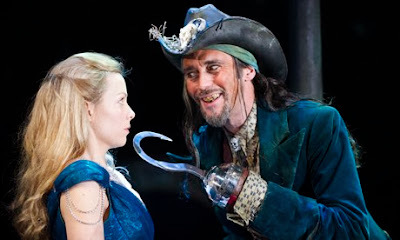 Guy Henry’s Hook is truly boo-deserving, capturing a neediness to Hook that hints at a desire for Wendy. As the tick-tocking crocodile (a classy green-eyed Arthur Kyeyune) swims past his ship, Hook’s sad reflection on the passing of time is another wonderfully perceptive comment from Hickson. Amongst a company of perfect performances, a sparkling gem of this Neverland is Charlotte Mills’ Tink. No size-zero diminutive waif, this fairy is an amply proportioned Estuary-English voiced chav who rips up our “fairy-tale” expectations of Barrie’s famous sprite and makes her a spirit for the modern common era. Bravo to the RSC for making a bold statement that rips up at least one of today’s ghastly role-models, so easily foisted on young girls. Andrew Woodall and Rebecca Johnson’s Darling parents are subtle portrayals of devastating grief and also some touching humour. As he occasionally hits the bottle whilst she, in a nod to the Suffragette times, explores a world of employment outside the home, so does the RSC subtly educate and inform. A (truncated) roll call of the show’s creatives salutes fightmeister Terry King who has packed the show full of swashbuckling sword fights, Colin Richmond’s gorgeous designs that use the full height and drop of the world class Royal Shakespeare Theatre and Matt Costain’s breathtaking aerial work. All under the wise and clever helm of Jonathan Munby. This is a classic tale, re-imagined and brought bang up to date whilst staying true to its heritage. Flawless perfect theatre that is unquestionably unmissable. Fun for all the family – and don’t forget your tissues!